, a French mathematician, was born in 165S* at Courtuson, in the principality of Orange. He was educated by his father, and was at a very early age made a minister at Eure in Dauphiny. But he was compelled to retire to Geneva in 1633, in consecpence of having given offence in a sermon, which he afterwards heightened at Berne by preaching against some of the established doctrines of the church. He then withdrew to Holland, but was so ill received by his brethren, that he determined to turn Roman catholic; with this design, in 1690 he went to Paris, and made an abjuration of his supposed errors under the famous Bossuet, rather, it is believed, to have an opportunity of pursuing his studies unmolested at Paris than from any motives of conscience or mental conviction. After this he had a pension from the king, and was admitted a member of the academy of sciences in 1707, as a geometrician. 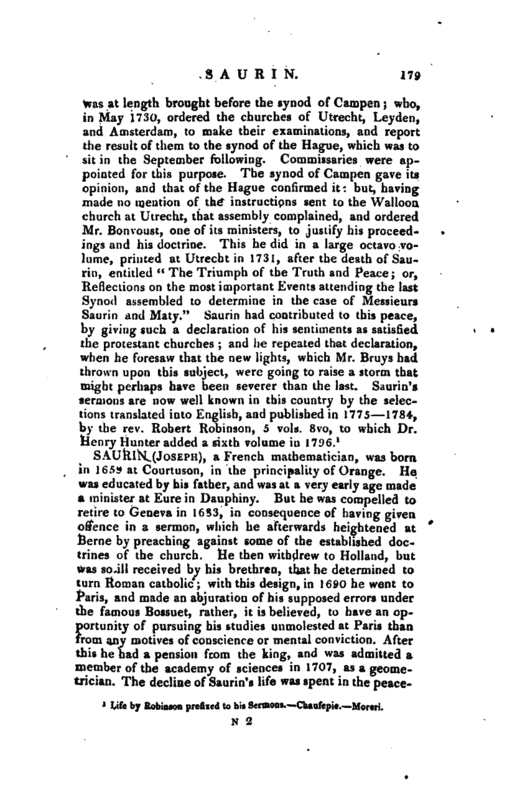 The decline of Saurin’s life was spent in the | peaceable prosecution of his mathematical studies, occasionally interrupted by literary controversies with Rousseau and others. He was a man of a daring and impetuous spirit, and of a lofty and independent mind. 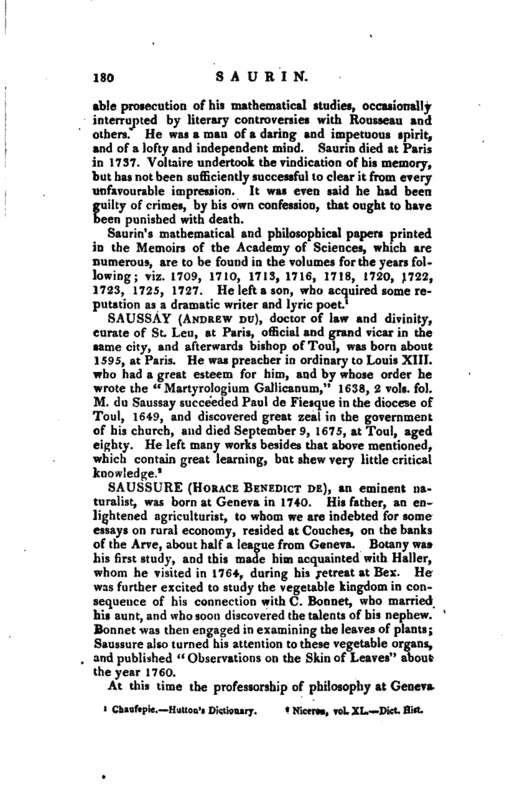 Saurin died at Paris in 1737. Voltaire undertook the vindication of his memory, but has not been sufficiently successful to clear it from every unfavourable impression. It was even said he had been guilty of crimes, by his own confession, that ought to have been punished with death.